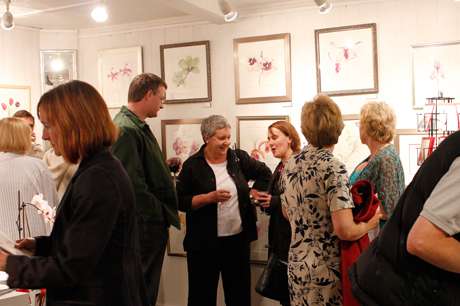 Glowing, luminous and jewel-like describe Lin Kerr’s orchid watercolours and I was delighted to attend the private viewing of her art at Dolphin Art Gallery. Lin is a lettering artist with a creative and diverse portfolio and her latest project has been exploring orchids in watercolour. She recently went on holiday to Singapore and, as artists do packed her paints, paper and brushes with a little space for a sarong or two. She knew she wanted to paint but it wasn’t until she arrived at the airport that the subject matter became obvious – orchids. There were masses of orchids everywhere from the airport shops to the local botanical gardens. 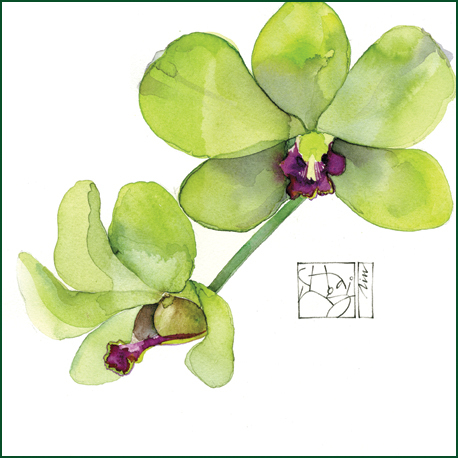 Orchids offer their own challenges as you paint because you can become distracted by the complexity of stems and leaves. Lin’s approach was to focus on the bloom and to float it in white space so that the flower becomes slightly abstract and we can appreciate its gorgeous colours and shapes. Lin also introduced a cartouche which acts as a design element and adds another layer of interest in the painting. A cartouche originates from Egyptian hieroglyphs where it was an oval with a horizontal line at one end which enclosed symbols and was used as a royal signature. Lin’s cartouches incorporate the name of the orchid. Make sure a watercolour art-piece is on your Christmas wish list! Prices start at £95 for an unframed giclée (a giclée is a high quality reproduction on textured art paper). 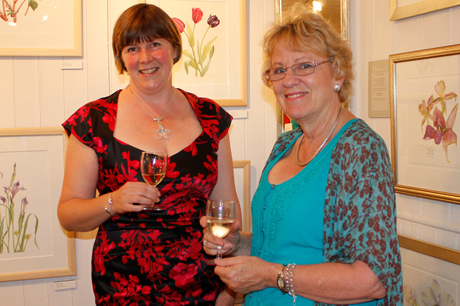 Lin is exhibiting with Penny Gould who is a botanical artist and if you are near Wantage in Oxfordshire, visit Dolphin Art Gallery to see these talented women. The exhibition is from 15 – 24 September 2012 and they are also demonstrating their skills. Penny is demonstrating on Wednesday 19 September from 12.00 to 2.00pm and Lin is demonstrating on Monday 17 and 24 September from 12.00 to 2.00pm.